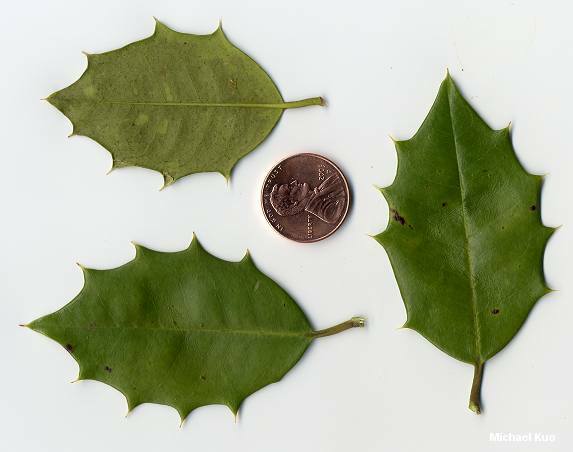 Thick, evergreen leaves with spiny tips; bright red "Christmas" berries; growing in the southern Appalachians and the southeastern United States. 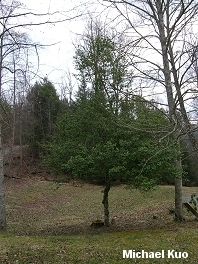 Habitat: Found in many forest types; rarely in relatively pure stands; absent or existing only as scattered understory trees in areas near cities, due to Christmas destruction ("Deck the halls with wholesale slaughter"). Stature: 40-60 feet high (usually smaller); to 2 feet in diameter; with a dense crown. Leaves: Evergreen; 2-4 inches long; simple; alternate; leathery; with spiny teeth; yellowish green above; paler below. 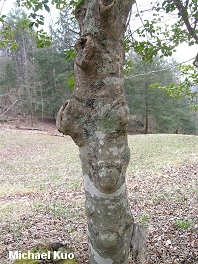 Bark: Thin; grayish; smooth, with warty areas. 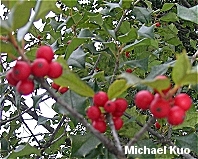 Fruit: A round berry; to about a quarter inch wide; bright red.